Have you ever looked at a light curve in Photoshop or Lightroom, and instantly thought, “that is way too complicated for me!”? 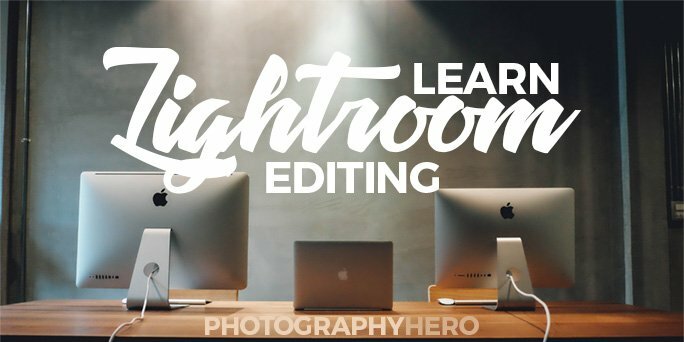 The truth is, the tone curve in Lightroom is not that complicated, and with a little knowledge you will be able to use the tone curve to create beautiful images in new and unique ways. So put away your fear, and let’s get started understanding the tone curve in Lightroom. A tone curve is a diagonal line that represents the tonal range of an image. This line can be manipulated by dragging in certain areas to change the brightness and contrast of your image in that particular tonal area. 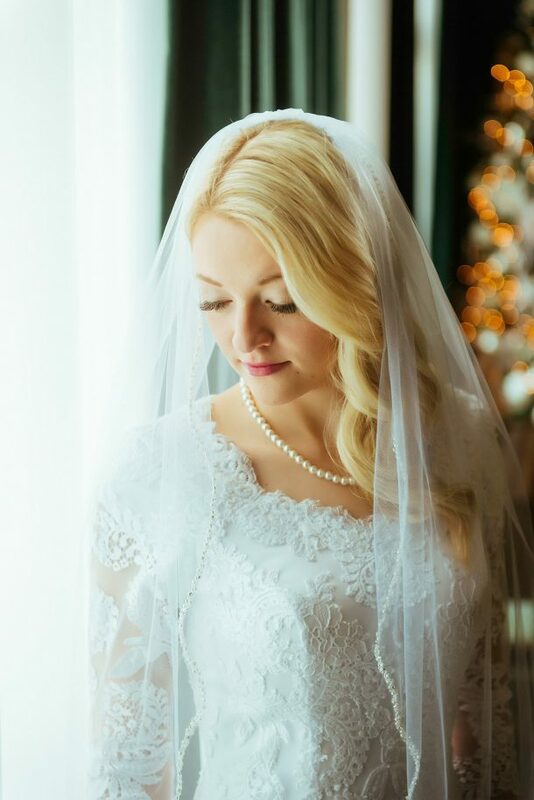 Some tone curves allow you to place anchor points to create sharper, more pronounced curves which produce stronger contrast and a unique look in the tones of your image. 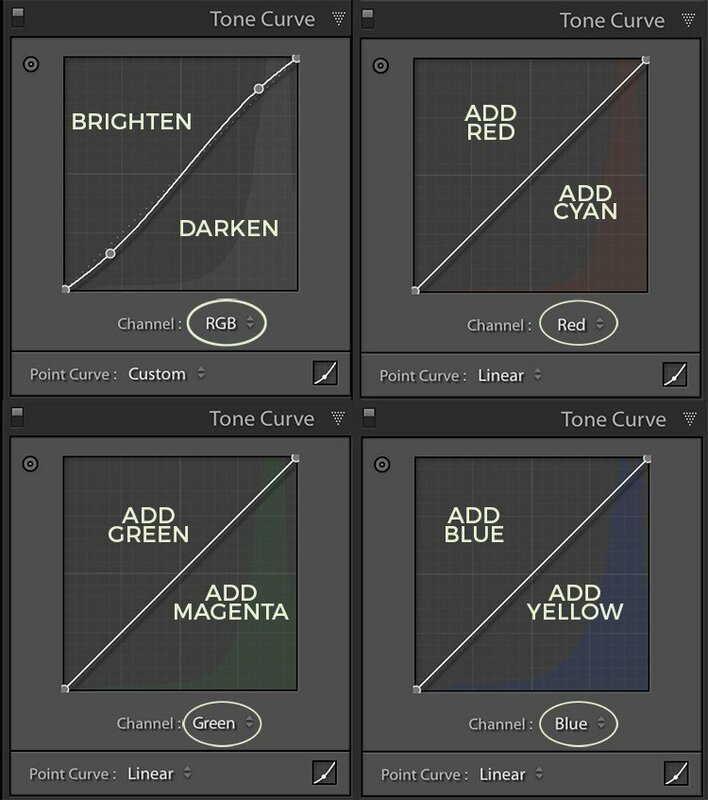 In Lightroom 4 or later, there are two types of tone curves: the region Curve and the RGB or Point Curve. The region curve is the default curve you see when you open the Tone Curve panel and is the less powerful of the two curves. It controls the luminosity or brightness of your image. The RGB or point curve is the new curve introduced in Lightroom 4 and is the more powerful tone curve. It deals with both luminosity and color and gives you the ability to add anchor points along the curve. You switch between the two tone curves by clicking on the button in the bottom right corner of the Tone Curve panel. The tonal range of a tone curve in Lightroom. As mentioned before, the tone curve in Lightroom is simply a graphical representation of the tonal range of your image. It is represented as a straight, diagonal line that you can manipulate to change the tone of your image. The bottom left represents the shadows or darker tones of a picture, the middle of the tone curve represents the mid-tones of an image and the top right represents the highlights. 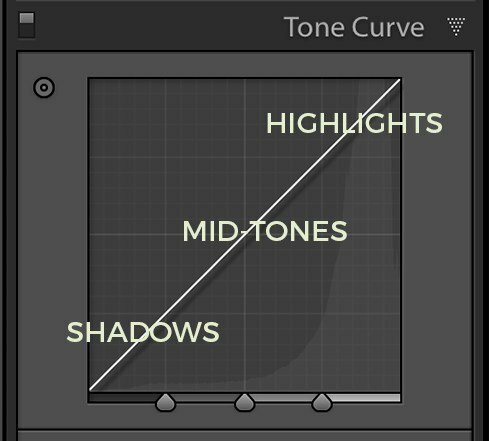 You manipulate a tone curve by clicking on the line in a particular region and dragging up or down. Simply put, dragging up adds brightness while dragging down will remove brightness and darken the image. If you wanted to lift the shadows, meaning add brightness into the shadow areas of an image, you would click on the lower left corner of the curve and drag upwards. The image below demonstrates this. As you click and drag the lower left portion of the tone curve, you add brightness to the shadows. Pretty straightforward. The Region Tone Curve of Lightroom. Notice in the images below, as I hover my mouse over certain areas of the region curve, a word appears at the bottom of the graph. The word that appears at the bottom of the graph coincides with a slider below. This indicates that you can adjust the region curve either by clicking and dragging on the line or by adjusting the slider. Something else to notice is the white bubble or ‘envelope’ that appears around the cursor as I hover above the region curve. This bubble or envelope is showing the limits of how high or how low the region curve can move. The top of the bubble equals 100 on the slider, while the bottom of the bubble equals -100 on the slider. Whether you move the slider to the positive or drag the curve up, the same thing occurs – brightness increases in that particular tonal area of the image. The opposite is true as well; move the slider down into the negative or drag the curve down to darken that particular tonal area of the picture. 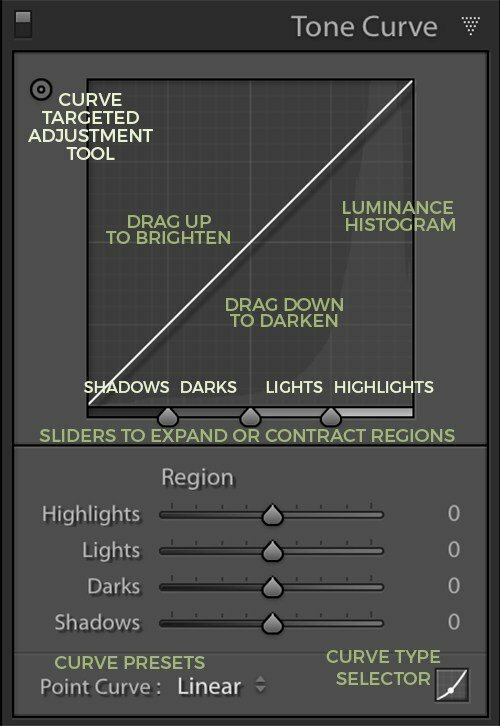 Take note in the image below, of how the shadows slider adjusts as I drag the tone curve up. The histogram behind the region tone curve. As you look at a tone curve in Lightroom, you will notice a histogram in the background of the region curve. This histogram shows you the amount of luminance data in each area of the tone curve. On the image of the tone curve above, you’ll see that the luminance mountain is mostly to the right side of the graph. It tells us the image that belongs to this tone curve is a high-key image or an image of mostly light tones. We know this because the luminance mountain is to the right meaning that most of the tonal data is in the highlight area of the graph. This tone curve belongs to the image below. It is easy to see why the tonal data falls to the right side of the tone curve; there are very few dark areas or shadows in the image. Understand that as you manipulate the left side of the tone curve, you are working with very few pixels, but as you adjust the right side of the tone curve, you are working with most of the pixels in the image. So be careful! 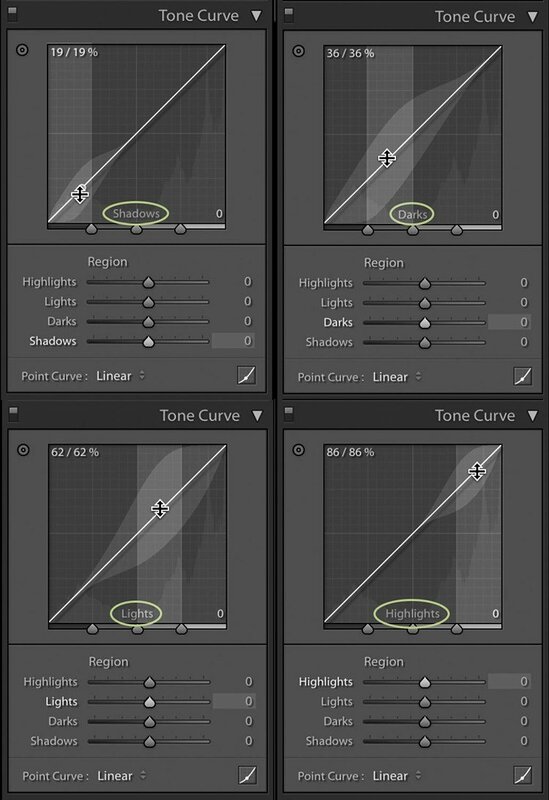 The details of the region tone curve in Lightroom. Below is a detailed diagram of the region curve itself. CURVE ADJUSTMENT TOOL: This tool when selected, allows you to click on a location in the image and drag up or down to brighten or darken those pixels. This is a great way to target a specific area in the image if you are unsure where that pixel lands on the tone curve itself. SLIDERS TO EXPAND OR CONTRACT REGIONS: At the bottom of the graph, notice the shadows, darks, lights and highlights all have equal amounts of space on the graph. By adjusting these sliders, you give more or less space to each region thus allowing the slider to affect varying amounts of pixels. For example, if you drag the leftmost slider to the right, you are giving the shadows slider more pixels to control and the darks slider less to control. 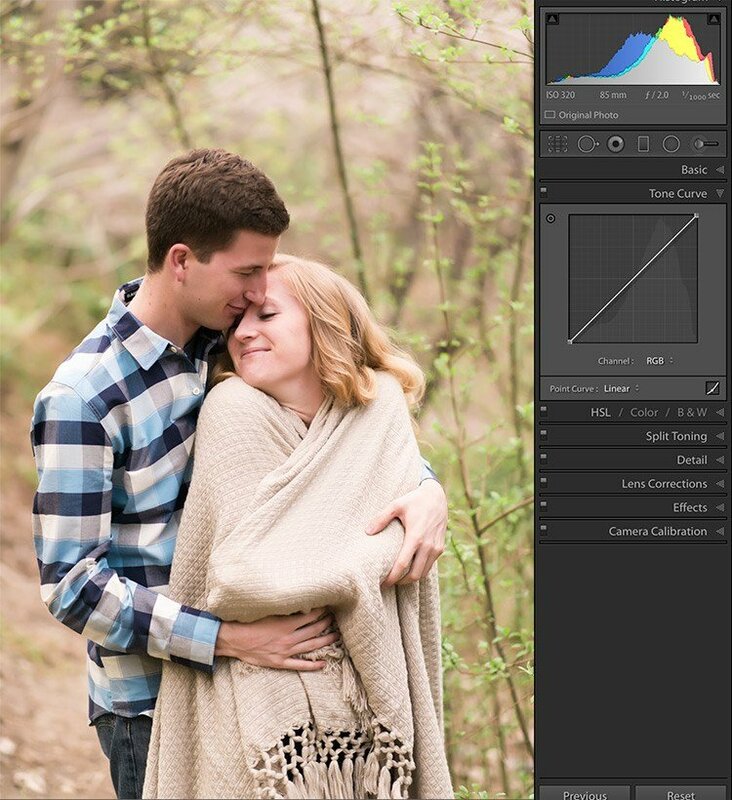 CURVE PRESET: Here is where you can select a curve preset to apply to your image. You can not create a curve preset here; you must set up and save it, in the RGB or point tone curve. When in the point tone curve area there will be a Save feature so you can record your curve for later use on other images. 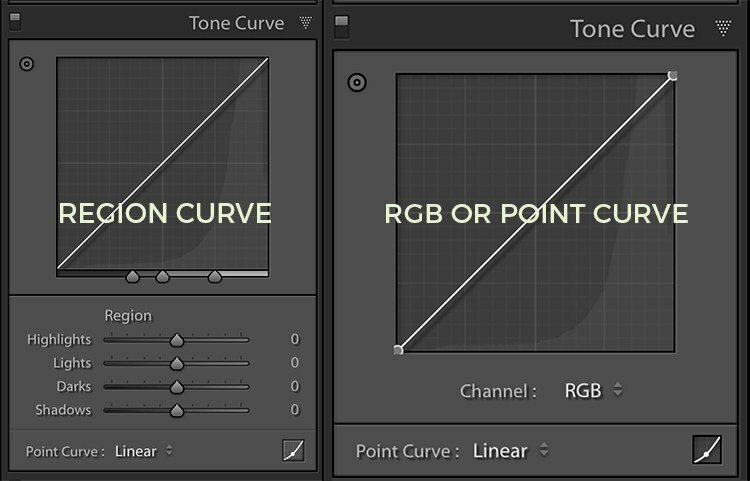 CURVE SELECTOR TYPE: In Lightroom 4 and above, there are two curve types, the region tone curve, and the RGB or point tone curve. Use this button to move between them. Why use the region tone curve in Lightroom? FIRST: Any adjustment made in the region tone curve does NOT affect the sliders in the basic panel. Therefore, if you are maxed out on shadow lifting in the basic panel, you can come here and lift them even more. Or, if you are trying to bring back detail in your highlights and you have dropped the highlights slider in the basic panel as low as it will go but still have not achieved the look you’re after, come to the tone curve and drop them even more. SECOND: The tone curve is perfect for presets. 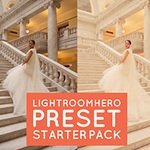 I can create a preset that restores shadow detail or adds contrast to an image and apply it without affecting any of the settings in the basic panel. For example, let’s say you want to boost the contrast of a picture where you have already adjusted the contrast and blacks sliders in the basic panel. Without disturbing those basic panel settings, you can simply come to the Tone Curve panel and create a simple S curve like the image below. An S-curve is a contrast curve that boosts brightness in the highlights while darkening the shadows. Doing this, allows you to add contrast without touching any sliders in the basic panel. Now that you understand the region tone curve in Lightroom, let’s talk about the RGB or point tone curve. This curve is the more powerful curve in Lightroom and is the curve that you will use more often than the region curve. The RGB or Point Tone Curve in Lightroom. The RGB or Point Tone Curve is the more powerful of the curves in Lightroom for several reasons. First, when the channel is set to RGB you have the ability to do everything you could do in the region tone curve. That is, adjust contrast and brightness across the entire image. But, you have the added benefit of placing anchor points to create more dramatic curves. Also there is no max or min envelope meaning you can get crazy with your curves. In the images below of the RGB and point tone curves, notice how the channel selected determines what colors in the image the curve effects. If, for example you are in the red channel you can add red to the highlights by clicking and dragging up an upper portion of the curve. If click and drag down on the upper portion of the curve, you will remove red and add cyan to the highlights, those colors being opposite on the the color wheel. When the channel is set to RGB, you effect all colors in the image, thus dragging the curve brightens or darkens the entire image. Understanding these curves allows you to adjust the colors in specific tonal areas of images. This is powerful if you find your shadows have a magenta cast or your highlights have a green cast. You can fix all of those things easily in the point tone curve area. These curves also help you accentuate color in specific areas. For example, when shooting images in the fall, I can add warmth to the shadows of my image by dragging up on the lower part of the red curve and dragging down on the lower part of the blue curve. That gives me an warm orangish tone to my shadows like in the image below. Notice how his shirt stays white. If I were to add warmth by simply adjusting the white balance slider, the shirt would gain a yellow cast. By using the tone curve to add warmth specifically to the shadows, you can avoid this. The power of anchor points on a tone curve in Lightroom. One of the most powerful features of the RGB or point tone curve is the ability to add anchor points along curve. These anchor points give you the ability to manipulate a curve in a more specific and dramatic way. In the image below, I click on a lower portion of the curve and drag it down, thus darkening all the colors of the image. If my goal is darken all the colors, then this is perfect and I can be finished. But what if I want to have darker shadows and brighter highlights? This can only be achieved with anchor points on a tone curve. In the image below you’ll notice the anchor point on the lower portion of the line holding the line down, in essence forcing my shadows to stay dark. As I drag the upper part of the line up, I create another anchor point that brightens the highlights of the image. Thus achieving darker shadows and brighter whites. 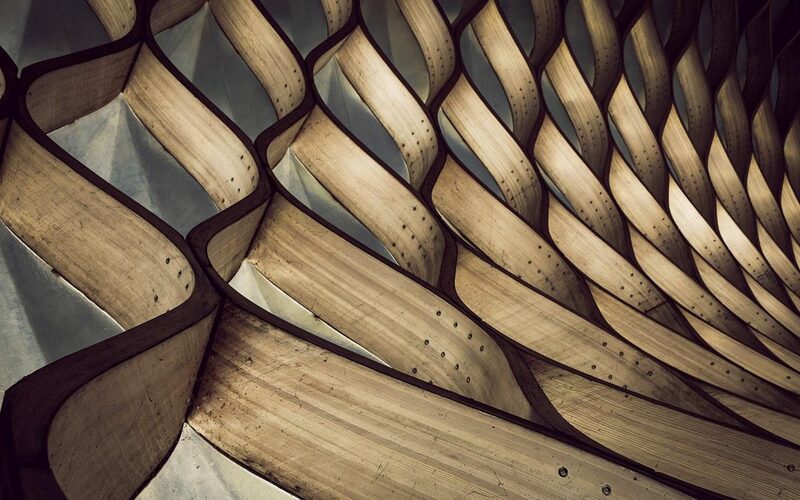 This curve I created by doing this is known as an S-curve and is a curve that causes contrast in an image. When you darken the dark tones and brighten the light tones you create contrast. 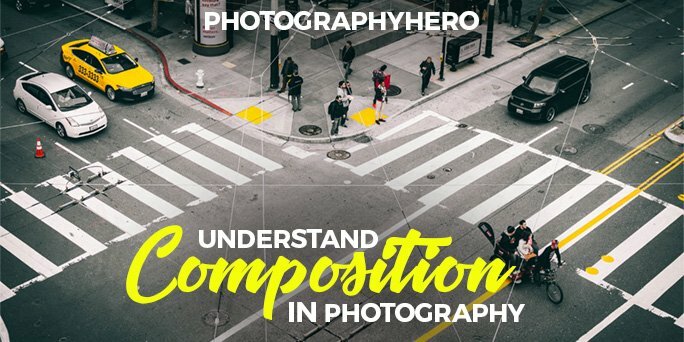 Why use the RGB or point tone curve in Lightroom? As you can see, the point tone curve is a much more powerful curve than the regions tone curve. Let me help you understand the reasons why you would choose to use this curve. FIRST: This curve allows you to add color to specific tonal areas of an image. As I demonstrated above, you can add warmth to just the shadows and not affect the whites. You could also add tones to highlights as well. SECOND: This curves allows you to remove color casts found in many images. If you have every struggled with mixed or odd lighting, use the point tone curve will allow you to remove color casts from the entire image or from specific tonal areas of your image. This is powerful if you have ever struggled to get skin tones looking correct or dealt with shifting colors. 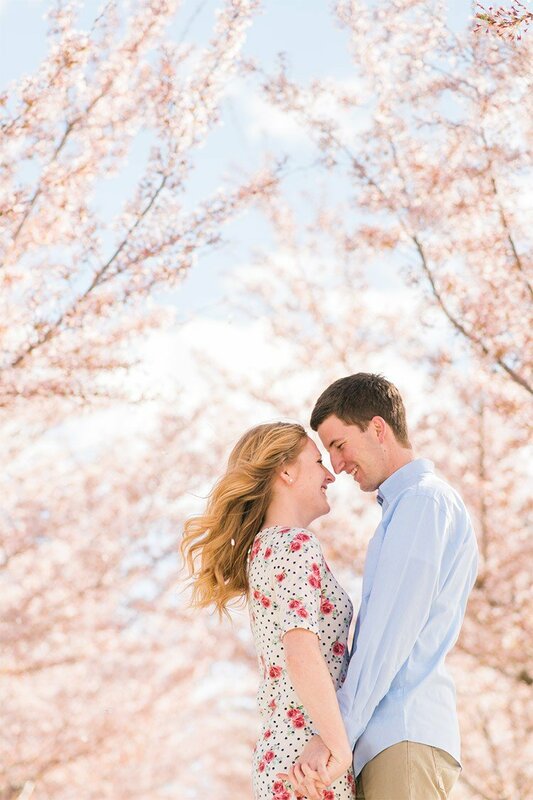 THIRD: This curve allows you to get creative and add a unique look to your images. Below I show you one example of how the point tone curve will allow you get creative, but there are so many other ways! Get creative with the point tone curve in Lightroom. A look that is very popular right now is the faded or matte look. 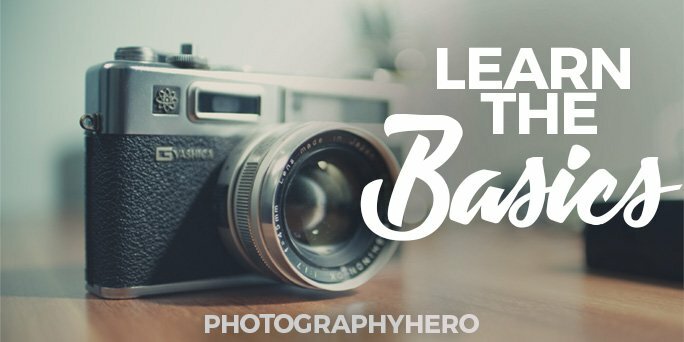 This matte look can help your images to have a more vintage feel. You create this look by manipulating the point tone curve. Below is the image before I add the matte look. Notice the untouched tone curve. To get the matte look you need to remove a true black point and a true white point to your image. With the channel set to RGB, drag the anchor point at the bottom of the curve up and in, and also drag the anchor point at the top of the curve, down and and in. The bottom anchor point controls shadows and by doing this you raise the brightness of the shadows removing a true black. The top anchor point controls the highlights and by dragging that down and in, you remove a true white point in the image. The image below shows you the curve and the image associated with that curve. Notice the histograms between the two images. The first image, you’ll see the tonal mountains touching both the left and right side of the histogram. This let’s you know that your image has good tonal range. The histogram on the second image is much different. The point tone curve has removed much of that tonal range and compressed the histogram more to the center. The histogram is telling you that this image has not true black and not true white points. Which is exactly what we were shooting for. Which image do you prefer? This look is not for everyone but hopefully you can see how creative you can get by using the tone curve. Take a look at this video to help you understand the tone curve in Lightroom. While you’re there make sure to subscribe to my channel. Hey guys I’m glad you’re here and welcome to this training that we’re going to do today on the tone curve in Lightroom. And if you haven’t subscribed to my channel then come on let’s do this. I don’t know what you’re waiting for it. It’s nice for me to see the numbers increase. That’s always fun. 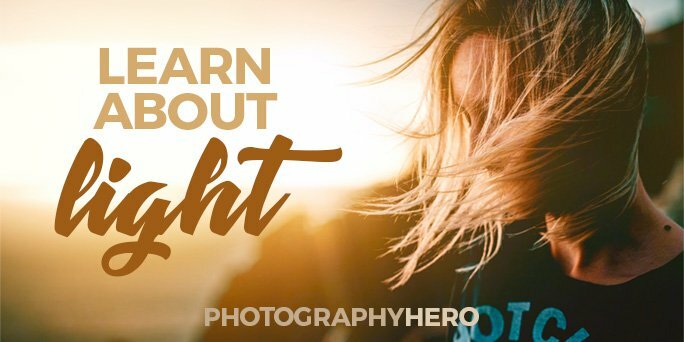 But by subscribing you’ll get notified as to when I have new videos that can keep you updated and also help you to continue learning Lightroom and photography so that you can become the best photographer that you can be. So let’s get started. So the tone curve panel is often one that intimidates a lot of people and the reasons the reason for that is because it is it looks a little more scary than it really is. And so as we dive in let’s kind of let’s kind of go over what it is what it does how things work. And then you’ll hopefully start to see some creative ways in which you can use it to make your pictures better. So let’s look at it really quick. And if you’ll notice basically it’s a graph and the curve is the line that goes from the bottom left hand corner to the top right hand corner and that line indicates how you’re going to manipulate the tones in your image. The bottom left side of that graph of that line represents the darker tones the middle represents the mid tones and the right side represents the highlights and so. Kind of that’s basically what a tone curve is as you click on the line and drag up you add brightness or you add whatever the channel is set to as you drag down you darken brightness or you remove whatever that channel is set to. We’ll talk about channels a little bit later. But but just for the basic purposes let me just grab a hold of this line and drag up and I’m in the lower portion. If you look over at this color bar these colored bars you’ll notice that the darker colors are starting to brighten. By dragging in the bottom left hand side of that line dragging it up. I’m adding brightness to those darker colors so let me turn it off. And turn it back on and you’ll see that that dark those darker bars lift. Now the the pure black bar doesn’t change at all. And I’ll show you how to change those and that will have to happen in the other curve. But but that’s how you would lighten your darker tones of your image. Now if you wanted to lighten the brighter tones of the highlights of the image you’d come up here and you’d drag this up as well. And so this am looking curve right here basically lifts the dark tones as well as lifts the brighter tones. Let me turn it on and off and you can see all of those middle bars of color have been brightened. K so to zero this out I just double click on the line itself. Or I can double click on the sliders. Now that’s one thing you’ll notice so we’re in the region curve. There are two curves if you’re in Lightroom 4 or later there are two curves there is the region curve and the R.G. your point curve and we’ll get to that one in a second but we’re in the region curve and in the region curve you’ll notice that as I highlight over the line a word appears at the bottom of the graph and that word corresponds with a slider. So we have shadows. We have Darks we have lights and we have highlights. You’ll also notice that a white kind of envelope or bubble appears around the line as I drag it up and down. Those are the limits the maximum I can drag the curve up or the maximum I can drag that curve down and those limits correspond with the slider so if I click right now and drag all the way to the highest point you’ll see that the the lights shadow which is currently high highlighted will go all the way to plus 100 so let me do that. I’ll drag all the way up to plus 100. What that’s telling me is I have lightened the shot the highlights to the brightest point that this curve will allow me to lighten them. And if you look at it it’s basically taken that that that that highest bright tone bar and made it completely white. So if I turn that off turn that on it’s brightened all of them but it’s made this one especially white and I can also zero this out by double clicking on the slider. So the regions curve. What what can it do for you. Basically the benefits of the raging curve is it is doing something similar to what some of the sliders in here can do. And so for example in this image where let’s say I wanted to add a little bit more contrast but yet my contrast is cranked all the way to 100. I also don’t want to deepen the blacks because as I do that as I drop this I start to lose kind of that light and airy Phil. feel that I have in this image. So another way that I could add more contrast without you know darkening my darks without kind of slamming my blacks down is I can come up here and I can increase the brightness of my highlights and then I can darken the shadows and what that creates is kind of an S-curve which creates contrasts so let me turn that on and off. So there’s the before there’s the after. So it still retains kind of that light and airy feel to the image but yet I’ve I’ve brightened it a little bit because I. I drug the highlights up so I brightened up the brighter tones and then I darkened the dark tones. And so it’s kind of just a subtle way that you can add more contrast or brighten or darken the image without touching the sliders here. Now the region curve is a curve that I don’t use very often and so and so as I teach you these things this might be just the curve that you kind of get to know but maybe don’t use as often the curve that that is used the most and I’ll click on it now is the point curve or the R.G.B. curve and you’ll see where it says channel right here. It says RGB. So that’s where the RGB comes from. And then it’s also called a point curve and the reason for that is because you can actually click and create anchor points anywhere along this line. So this curve becomes more powerful because those envelopes that limit my up and down movement are gone. And by creating anchor points I can now precisely determine where I want my brightness or my darkness to come. All right so double clicking on these points gets rid of them and then you’ll notice in the bottom corner I have a point and in the top right hand corner I have a point so if I come back to this image right here how I can light up my true blackpoint is by taking this very bottom point and raising it up and you’ll notice that my image no longer has a true black I can do the same with the top point. I can drag this down. And you’ll notice that my image no longer has a pure white. Both of them are simply a shade of gray and there’s some value in that in knowing how to do that. And and being able to do that which I’ll talk about later but that is how you’d get rid of a true blackpoint or a true white point in your image is coming in here and dragging Now the RGB. When you’re in the point curve and you’re set your channel is set to R.G.B it will act very much like the region curve. The benefits of being in here is that S-curve that I want and I go in this image and create it that S-curve that I create I can be much more precise with it. So let’s say I create this S-curve But let’s say I want to I want to darken the mid tones a little bit so if I click in here and drag down I darken the mid tones. Well I don’t love that so that didn’t do anything for me so I’ll get rid of that. But let’s say I don’t want to have a pure white. So let let me click up here and drag my pure white point down. OK. And look how that creates kind of this cloudy feel to the image. Let me turn that on and off and it it almost kind of isolates the couple. So can you see how I can start to get really creative with this curve to make my images really unique. Let’s go to. Let me get rid of these. Oh I got rid of that top point. Go create that back. Get rid of this one. OK let’s go to this last image. And so. So what I did in that last one it was kind of create a vintage look where there’s no true blackpoint and no true white point. And so let’s take a look at this image let me create a copy of this image and let me do that. Let me take away. I didn’t click on the right spot. Let me take away the blackpoint. Can I just move in just a bit and let me get rid of this white point as well. Right there. So by taking my curve and doing that what I’ve created is kind of this flat or matte look or vintage look to my image and so let’s compare the two that is with the curve in that position here is with a regular curve. So can you see how it’s kind of given that vintage look. Now you may love that look or you may hate it it doesn’t matter to be honest with you. It’s simply something that you can do to get creative. And for some images it will work and for some images it will look absolutely stupid on so. So the choice is yours for this image and I in fact specifically chose this image because I thought it would look. I thought it would have a good feel to it. I don’t need to have deep blacks in this image. I don’t need to have you know bright white i can have kind of that softness to it that kind of fits this feel this kind of warm toned feel and so that’s why I chose this image. Other images that may not work great at all. Excuse me. OK. Let’s keep learning so if I’m in if I’m in the R.G.B be your point curve. So let’s look at this girl right here and notice my sliders they’re all zeroed out except for the exposure I’ve dropped that just a bit. But let say I wanted to add contrast I could come in here and I could make my S-curve K like we’ve already talked about and already learn. But let’s say you want to warm this image up and this is where you’d go into a different channel so you have a red channel a green channel and a blue channel. Now the opposite of blue on the color wheel is yellow. So if I drag up I add blue. Let’s do that so I’ll drag in the middle so this is to your mid tones if I drag up I add blue which is not what you want to do. If I drag down I add yellow. So we’ll just we can just drag down right there and I instantly warmed that image up. So there’s the before and there’s the after and I’ve done that all with a curve. 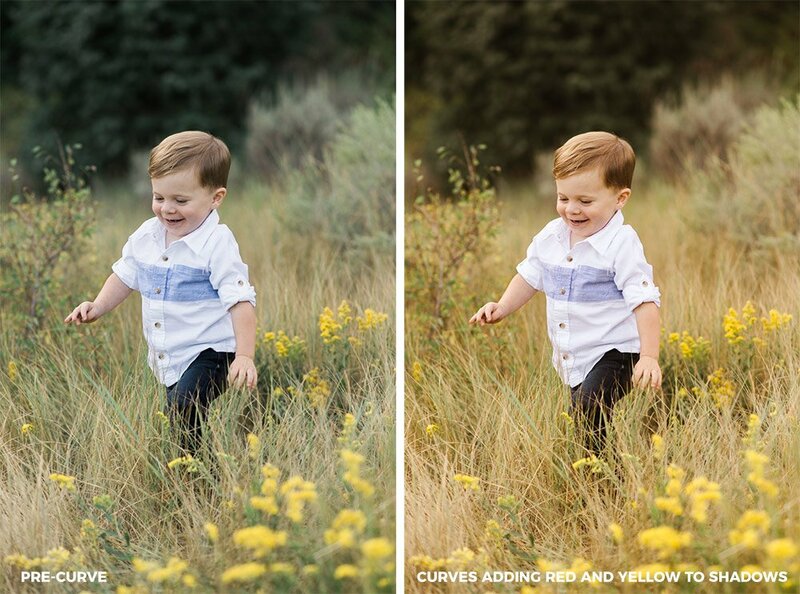 Now let’s say let me actually go to this image right here and and kind of staying with that feel so I love this cute little picture this little boy running through these kind of grasses and things. But let’s say I want to give it a little bit of a fall look to it. OK. So what I would want to do with that is I would want to add a little warmth to the shadows. I don’t really want to add it to everything because if I do maybe this White is going to go have this color cast to it. Maybe his skin is going to go too warm. And so the nice thing about the point curve is that I can create points and choose exactly where that warmth come. Let’s start with yellow. I want to bring it in the shadows. Remember the left hand side of a curve is shadows. So if I drag this down K so let’s put it about right. That might be a little heavy right there. And then I don’t want it to happen. I don’t want any color shift in the mid tones or in the highlights and you can see how this curve bends that it actually is bringing some of that yellow into the mid tones in the highlights. I fixed that by clicking creating a dot and dragging that back to the baseline right there so I had this little bubble right here and that is adding. I’ll turn it on and off a little bit of yellow or warmth into the just into the shadows now to create a warm feel you don’t just want yellow. Right. Because that’s just basically adding yellow. I want to add a little bit of red too because red and yellow create this orange ish color which is kind of a false look. So I’m going to do the same thing here in my red channel if I drag up I. Adds just a little bit of red. Now I don’t want to add too much red yellow to be the dominant color. And then again same thing get it out of my highlights. So let me turn the tone Khurd curve on and off. Can you see how through the shadow areas I have simply added a little bit of warmth no warmth is touching his shirt nor his skin. Now if I wanted to add it to his skin I could have done that I could I could come up here and do the same thing. So let’s say I come up here and I had just a touch of red Now notice I’ve got a hump here it flats out at the mid tones and then a hump here so I’ve added red to my shadows none to my mid tones and some to my highlights. And let’s go back to the blue channel and do the same thing. I’ll drag down here so I add a little bit of yellow. Right about. That might be a little heavy Let me turn it off and on. That’s a little flat on his face. So let’s go about right there. But right like that. So now I’ve added warmth to the highlights and to the shadows but nothing to the mid-tone. So hopefully you can see the power of these tone curves that you can put color exactly where you want it or you can remove color from exactly where you want it. Have you ever shot in a mixed light situation where maybe you’re using natural ambient light but there’s also an unnatural light source like a light bulb or an ink or a tungsten light or or halogen light or something like that and it creates these kind of blue shadows that that you have you could easily remove those by coming to the tone curve coming to the blue channel and dragging down on the lower part of the curve. That is going to remove a blue tone from the shadows. So I hope you can see the power of the tone curve. I really feel like once you begin to use it it’s going to really help your images. Now you’re not going to use it on every image of course but it will allow you to get creative. One place that I use it a ton is I use it in presets. And the reason I like to use it is in pre-sets is because it allows me to tweak an image and either add contrast or brightness or or color shift or whatever I want without touching the sliders in the basic panel. And so then what the sliders in the basic panel become are simply ways that I can fine tune or tweak the image to get it exactly how I want it. So there’s that tone curve. I hope that helps you kind of understand it makes it less. I don’t know scary to go into and use again. Subscribe to my channel I think that that you’ll like the videos that I have coming up or the videos that are currently there. But thanks for being here. And I hope that you’ve learned a lot by. 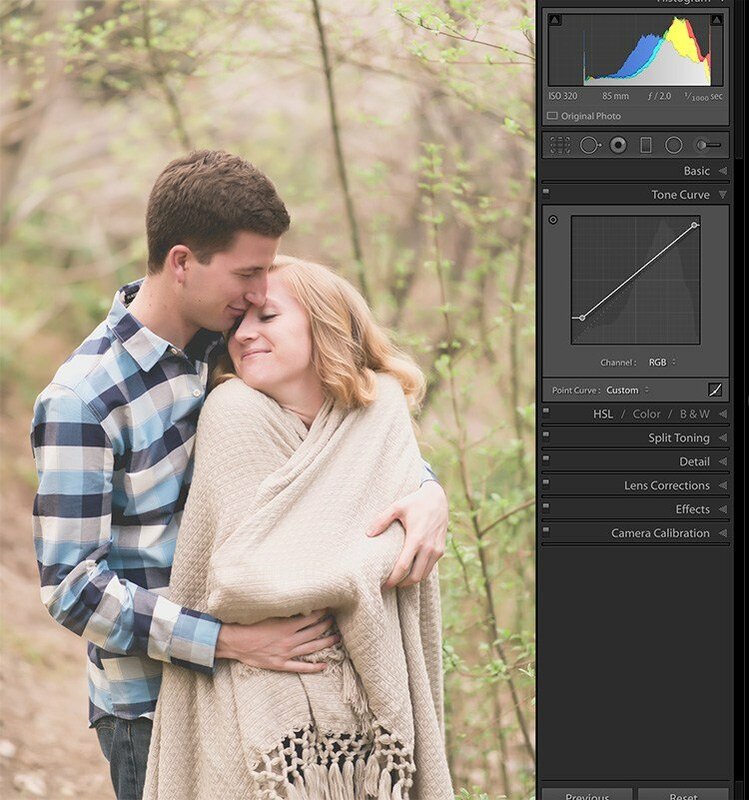 The tone curve panel in Lightroom is a powerful tool that can help you as you edit your images. Although tone curves may appear to be difficult, hopefully you have learned that they are not difficult at all. 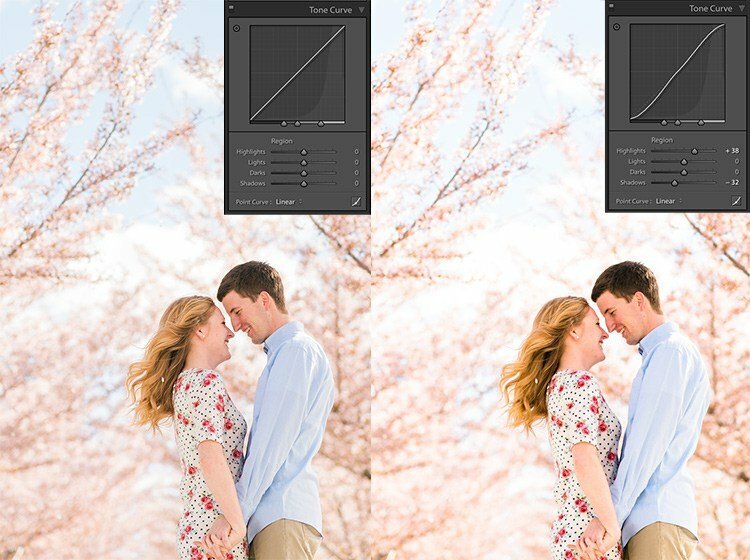 By simply understanding the curves, and their uses you now have the ability to not only create much more unique images, but to fix or add complicated color shift to your images. By understanding the tone curve panel in Lightroom, you become better at creating the beautiful images you want to create.